The Palestinian boy in Jean Mohr’s photograph elicits sadness just by looking into his eyes (WOR 623). He is of unknown age, so the caption says, because we are not sure if he is even a child although he is small enough to be a child. His child-sized tummy, poking out from beneath his tight Grease t-shirt is tiny like a child’s. He doesn’t have a man’s beard. Nor is he a toddler. He has a playful half-akimbo pose with his left arm perched on his hip, a boy’s shaved head like a London chimney sweep and his body semi-contrapposto – but his face is veritably adult looking with those sad sad eyes. “You see it in our children who seem to have skipped a phase of growth or, more alarming, achieved an out-of-season maturity in one part of their body or mind while the rest remains childlike” (623). Said has similar impressions to my own. Except Said is writing in the first person plural “we.” “Our children,” he says. 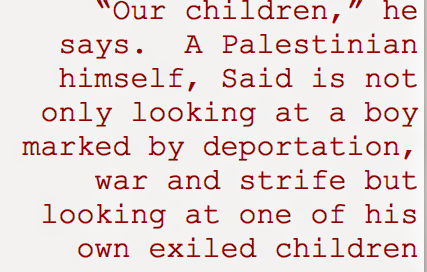 A Palestinian himself, Said is not only looking at a boy marked by deportation, war, and strife but looking at one of his own exiled children, a child who has grown up too fast, as the clichéd expression goes. 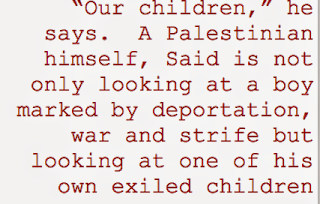 This assertion of “we” makes his already poignant comments – and the photograph itself – an intimate expression of the pain and loss of the Palestinian exile. This is the portrait of a child whom the Palestine’s enemies say, “Kill them before they kill you” (623). This is a child that the enemy says could be a potential terrorist; they say in Lebanon you should kill the children because they’re the ones who’ll kill (623). The child in the picture is lost. The real child who suffers is lost in a bungled list of population reports and military strategy. But how can you justify that kind of statement when you look at this photograph – or any of the photographs in the After the Last Sky? What kind of sloughing off of humanity do you have to do until you reach the point of disregard for human life? Is the point of no return when you can believe that “there are no Palestinians” (623)? Insert any group here for “Palestinian”. When you can strip the Palestinians of identity like, “Non-Jews. Terrorists. Troublemakers. DPs. Refugees. Names on a card. Numbers on a list” (624)? It seems to me, once you strip a people of their sense of place and identity you can then place upon them labels sufficient to your own cause. The Palestinians have nowhere to call Palestine, no stable place to call home (although there has been an attempt by Palestinians like Said to refer to this disposed land as Israel/Palestine). The boy in Mohr’s photograph, ill-fitted in his American style t-shirt – what is he thinking? What is he trying to tell the observer? What can be read in his face? If anything? 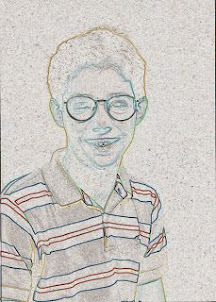 He is similar to another boy who appears later on in the book. 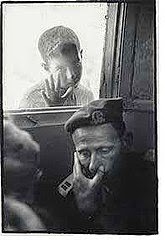 This time a young villager is peering into the window of an Israeli officer in Kalandia, near Ramallah in 1967 (640). In a series of photographs by Mohr that illustrate the juxtaposition of two worlds: one Israeli and the other Palestinian, in this one he captures another Palestinian boy caught by the photographer peeking into the quotidian life of the conqueror’s den. The photographer is taking the photograph from the inside capturing the child looking inside. The soldier is oblivious to the child and lost in thought (640). The Israeli officer has one hand on his chin and the villager has one hand on the windowpane, a look of shy curiosity imbued in his eyes. He has been caught by the gaze of the camera and looks downward just enough to give himself away as the forgotten one.